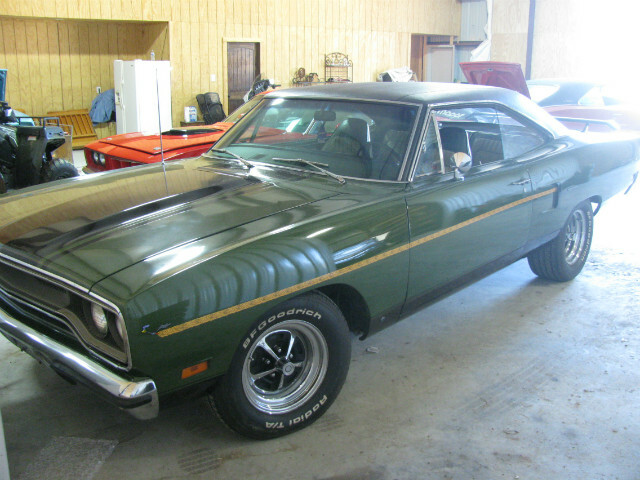 1970 Plymouth Roadrunner, 383 big block, 4-speed, nice solid driver. green on green. There were over 20,000 70 roadrunners built, with around 7993 4-speeds. This car being a rare collector mopar being an original 3-speed manual and only 584 built with 3-speed. Have original fender tag. It now has a 4-speed, runs strong. Just had the motor and 4-speed pulled out, detailed the engine bay, resealed new gaskets on entire engine, valve job, oil pump, complete tune up, etc. rebuilt 4-speed with new clutch, etc. have pictures.